286 Commonwealth is located on the south side of Commonwealth, between Gloucester and Hereford, with 284 Commonwealth to the east and 288 Commonwealth to the west. 286 Commonwealth was designed by architect Samuel D. Kelley and built ca. 1880 for building contractor William Seavey Rand, one of two contiguous houses (286-288 Commonwealth) he built for the Boylston National Bank of Boston, owner of the land, for speculative sale. The land for 286-288 Commonwealth was part of a parcel acquired by the Boylston National Bank on October 21, 1876, from Albert J. Fernald. The parcel also included the lots where 284 Commonwealth and 30-32-34-36 Gloucester were built. William S. Rand also built the houses at 30-32-34-36 Gloucester for the bank. The parcel was part of a larger tract of land originally purchased by Nathan Matthews on January 2, 1871, from David Sears, Jr., Frederick R. Sears, and Knyvet Sears. Click here for an index to the deeds for 286 Commonwealth. After the houses were completed, the bank continued to hold the property until a buyer was found. On June 30, 1882, it sold 286 Commonwealth to William S. Rand and he sold it on the same day to boot and shoe dealer Edwin Luther Sanborn. By the 1882-1883 winter season, Edwin Sanborn and his wife, Lydia Hilton (Emmons) Sanborn, had made 286 Commonwealth their home. They previously had lived at 67 Rutland. Lydia Sanborn died in November of 1890. During the 1890-1891, Edwin Sanborn was living elsewhere and 286 Commonwealth was the home of Mr. and Mrs. R. M. Greeley. They had moved by the next season and Edwin Sanborn was living there once again. In June of 1900, Edwin Sanborn married again, to Caroline F. Andrews. After their marriage, they lived at 286 Commonwealth until his death in November of 1907. 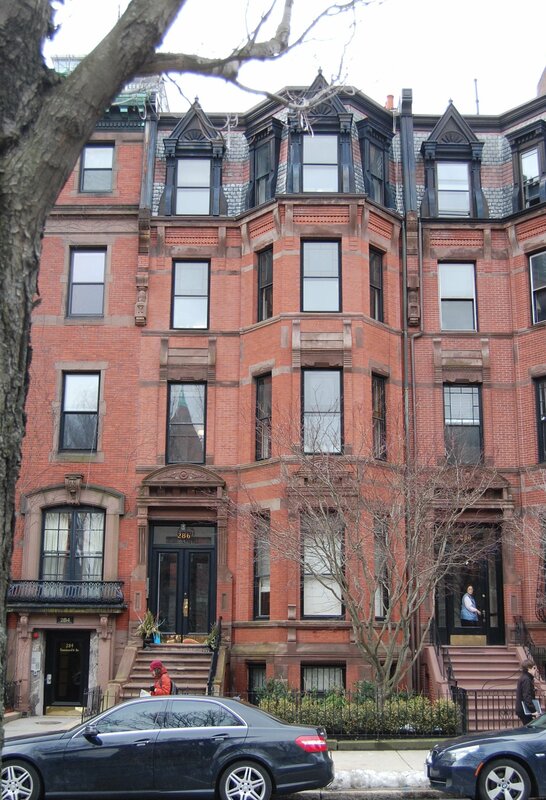 Caroline Sanborn moved soon thereafter and by 1910 was living in Brookline. The house was not listed in the 1909 and 1910 Blue Books. On July 29, 1909, 286 Commonwealth was purchased from Edwin Sanborn’s estate by John A. Brewster. The next day, the property was acquired by William Henry Gleason and Elisha Slade Williams. William Gleason and Elisha Williams were both officers of the Revere Rubber Company. They acquired 286 Commonwealth on behalf of Henry Curtis Morse (the Boston Globe‘s July 30, 1909, comment on the transaction indicated that the house had been purchased by “the estate of Henry C. Morse”). Henry Curtis Morse was a former furniture manufacturer and dealer who had entered the rubber manufacturing business in the early 1880s and served as treasurer and general manager of the Revere Rubber Company until his retirement in the early 1900s. The Revere Rubber Company was acquired by the United States Rubber Company in 1909, and the purchase of 286 Commonwealth for his benefit probably was connected with the acquisition. By the 1910-1911 winter season, Henry Morse and his wife, Kate Millicent (Stetson) Morse, had made 286 Commonwealth their home. They previously had lived at 2 Union Park, which he continued to own. Henry Morse died in January of 1912. On March 25, 1912, William Gleason and Elisha Williams transferred 286 Commonwealth to Kate Morse. The next day, she transferred the property and other real estate and investments she had inherited from Henry Morse to a trust for her benefit, with William Gleason and Charles T. Gallagher as trustees (although the trust was dated March 26, 1912, it was not recorded until February 28, 1918, when William Gleason and Charles Gallagher sold the Union Park property). Kate Morse continued to live at 286 Commonwealth until her death in May of 1924. The house was not listed in the 1925-1927 Blue Books. On September 15, 1924, 286 Commonwealth was purchased from the estate of Kate Morse by James M. Burr. On February 11, 1925, it was acquired from James Burr by Amelia (Newman) Leftovith, the wife of Samuel Louis Leftovith (Leftovich), a civil engineer. They lived in Brookline. By 1926, 286 Commonwealth was leased by Leon Henry Fairbanks, an apartment and real estate manager, and his wife, Nellie A. (Delaney) Fairbanks. They previously had lived at 99 Bay State Road, the Hotel Fairbanks, which he managed. Based on the entries in the 1926-1929 Boston Lists of Residents, it appears that they operated 286 Commonwealth as a lodging house. The Fairbankses continued to live there until about 1930. In December of 1929, Samuel Leftovith applied for (and subsequently received) permission to install fire balconies on the rear of the building, connecting with 288 Commonwealth. 286 Commonwealth was shown as vacant in the 1930 and 1931 City Directories. By 1932, 286 Commonwealth was the Kappa Gamma Chi fraternity house. It continued to be located there until about 1934. 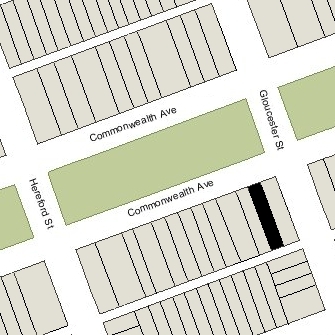 286 Commonwealth was not listed in the 1935-1937 Blue Books, and was shown as vacant in the 1935-1937 City Directories. On March 5, 1937, the Cape Ann Savings Bank foreclosed its mortgage to the Leftoviths and took possession of 286 Commonwealth. On June 12, 1939, 286 Commonwealth was acquired from the Cape Ann Savings Bank by Roslynd (Swartz) Bloomberg, the wife of Harry Bloomberg. They lived in Kew Gardens, New York. The property continued to be shown as vacant in the 1938-1941 City Directories. By 1942, it had been converted into five apartments but was being occupied as ten units. On July 27, 1942, 286 Commonwealth was acquired from Roslynd Bloomberg by Sidney H. Omansky. On August 8, 1942, 286 Commonwealth was acquired from Sidney Omansky by Louis Spector and his siblings, David Spector and Goldie (Spector) Chernus, the widow of Sidney Chernus (Sandor Czernogust). Louis Spector was a roofing contractor. He and his wife, Mae (Chernus) Spector, lived in Brookline; Mae Spector was the sister of Goldie Adler’s deceased husband. Goldie (Spector) Chernus remarried in 1944 to Jacob Adler. In February of 1943, 286 Commonwealth was cited by the Building Department because the occupancy had been changed from five to ten apartments without a permit. The violation was issued again in January of 1945. In March of 1946, Louis Spector applied for (and subsequently received) permission to convert the property from five apartments into ten apartments, providing additional egress as required. On July 23, 1946, 286 Commonwealth was transferred by the Spector family to Charles Mitchell, and on December 27, 1947, it was transferred by him to the Chernus Realty Company. It continued to hold the property until August 29, 1969, when it was transferred back to Louis Spector, David Spector, and Goldie (Spector) Chernus Adler. On September 14, 1979, the Phaeton Corporation purchased 286 Commonwealth from Goldie Adler and the estates of Louis Spector (who had died in November of 1976) and of David Spector (who had died in March of 1979). In April of 1980, it applied for (and subsequently received) permission to convert the property from ten to five apartments. In January of 1981, it converted 286 Commonwealth into five condominium units, the 286 Commonwealth Condominium.